What are some of the principles guiding an artist’s hand when making lines? When discussing any principle, especially in the arts, there is an understanding that the principles guiding an artist’s hand are interconnected. I mention this because the following explanation of the principles behind the phrasing of line (i.e. variations to the attributes of line arising from changes in a stroke’s thickness, opacity and flow) share a role in how lines are phrased with a plethora of other closely related principles, such as those discussed in the last post regarding the representation of corners. In short, the following explanation may seem like there is a set of clearly defined principles underpinning the phrasing of line, but in truth each of the four principles addressed below (viz. the Ingres principle; weighting a line; projecting a line; squishing and stretching a line) does not function in a distinctly different way and independent of other principles. 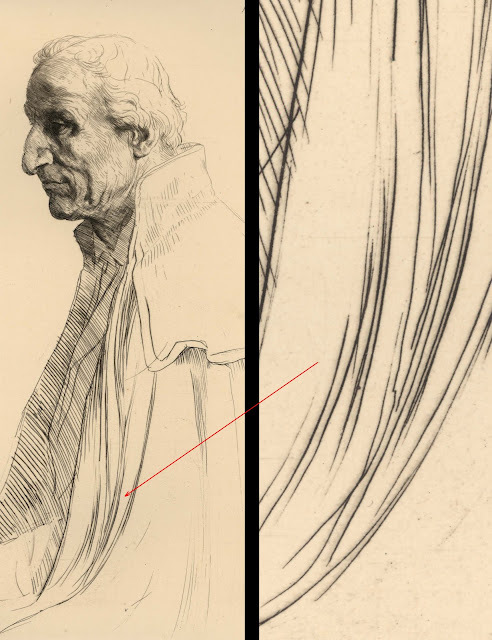 The first principle that I wish to discuss, the Ingres principle, concerns the phrasing of a subject’s silhouette edge to replicate variations in the subject’s surface contours. For example, if an artist were to apply this principle to portraying a figure’s arm then the sharply angled contours of an elbow may lead the artist to treat the silhouette edge of the elbow with a strong line by comparison with a much softer line where the contours of the arm change to the rounded muscles of the upper arm. 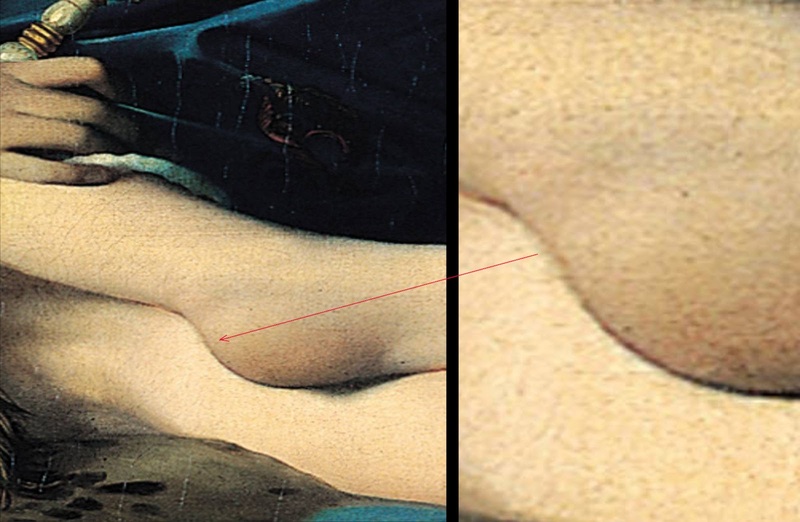 In the illustration of an arm shown below, for instance, I have marked the transitional changes to the outer edge of the arm’s underside with most angular contour area marked as point A and the softest contour marked as point D.
Illustration showing phrased variations, according to the Ingres principle, in the treatment of the outer edge of an arm. 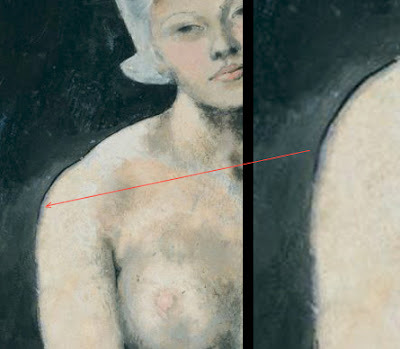 Point A marks the area at the elbow where most angular contours of the arm are shown by a bold red line delineating the silhouette edge. Point B is the area of the elbow where there is less of an angular contour than at point A and is shown by a less opaque, cool blue line floating slightly away from the silhouette edge. 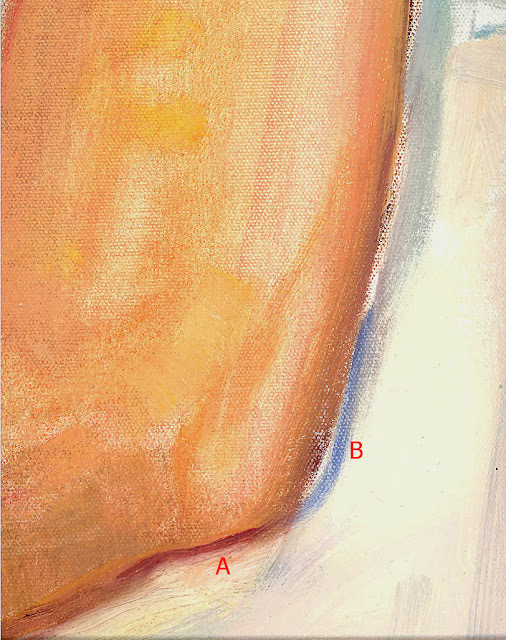 Point C is the muscled area of the triceps and as this area has more rounded contours than at point B it is shown with a softly applied line. Point D marks the area approaching the armpit where the contours are more rounded than any of the previous areas and is shown with a faltering and faintly laid line. 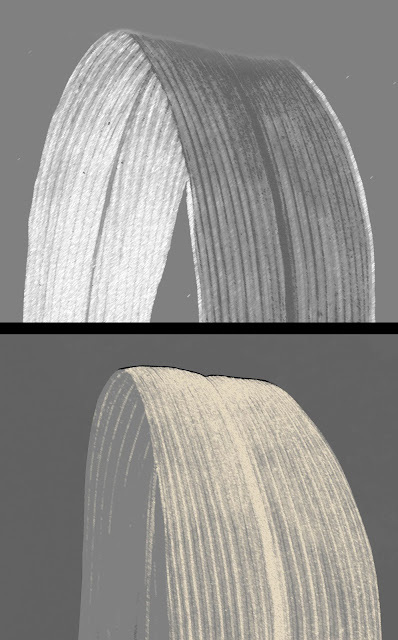 Another example would be if an artist were to portray the top edge of a gently curved leaf in a line followed by another line describing the top edge of a tightly curved leaf (see illustrations below). In this scenario, an artist representing the gently curved leaf would almost dissolve the line so that it appeared to be very soft (see upper digitally modified illustration) followed by an emphatically strong line when drawing the tightly curved leaf (see lower digitally modified illustration). 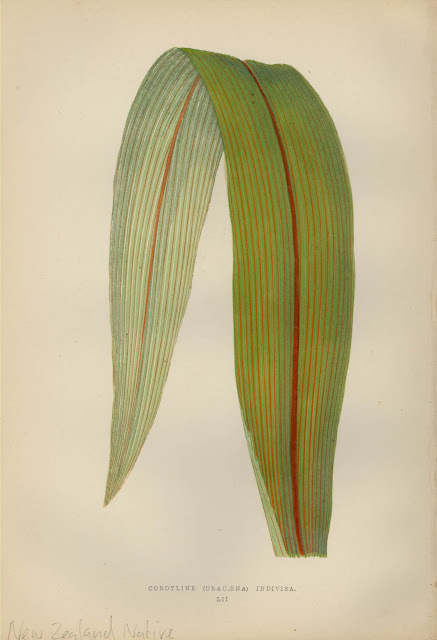 The rationale for this difference in the two attributes of line is that the eye can see further around the gently curved leaf and so the line representing this view is accordingly soft whereas the eye is unable to see around a tightly curved leaf and so the line representing it is accordingly strong and crisp. Originally purchased as a woodblock printed in colours and finished by hand (and it may be) but I believe that it is a chromolithograph. Condition: Crisp impression in pristine condition with blank verso. There is a pencil inscription on the lower left “New Zealand Native.” I am selling this print for $60 AUD including postage and handling to anywhere in the world. Please contact me using the email link at the top of the page if you are interested. 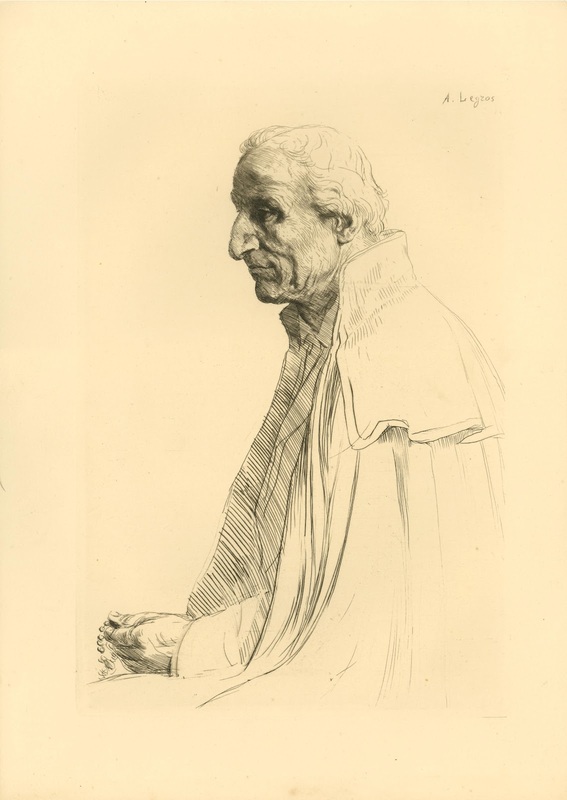 From a personal standpoint, the titling of this principle is a little problematic as the artist I have associated it with, Jean-Auguste-Dominique Ingres (1780–1867), is not the finest exemplar of its use as there are many of his artworks in which it is not evident at all. Nevertheless, as shown in the details below taken from a selection of Ingres’ artworks the phrasing of the silhouette edge is clearly evident. Moreover, until I determine a more appropriate artist with whom to credit the principle as its “father”/progenitor, I will persevere. Later artists have certainly applied the principle in a very clear way, such as Picasso, and I can still remember my pleasure as an art student in examining the skilful play of the silhouette edge in his ravishingly beautiful gouache, La Belle Hollandaise [The Beautiful Hollander] (see detail further below). The second principle, weighting a line, involves a transition in a line from a pale tone where the line is further away from the ground to a dark tone where the line is closest to the ground. In short, the principle is all about the artist varying the degree of light and shade in a line—usually the outcome of changing the pressure on the drawing instrument—to connote the sensation of gravity. 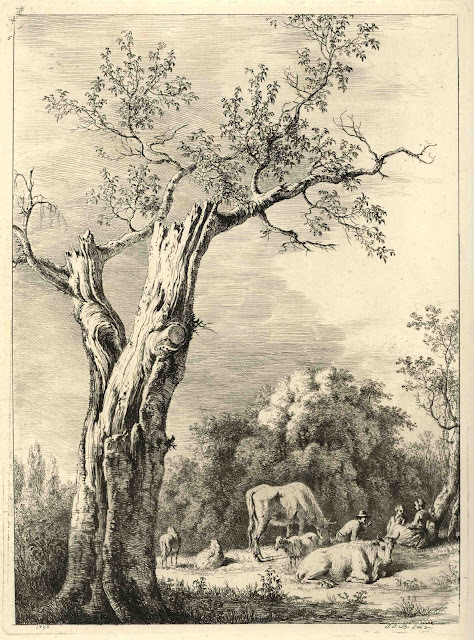 A practical example of this type of line phrasing may be seen in Jean Jacques de Boissieu’s (1736–1810) L’Hiver, d’apres un dessin fait a Saint-Chamond [Winter, after a drawing by Saint-Chamond], 1795 shown below. Here a gnarly tree spans the composition with its upper branches touching the top of the image border and its trunk rooted close to the bottom border. 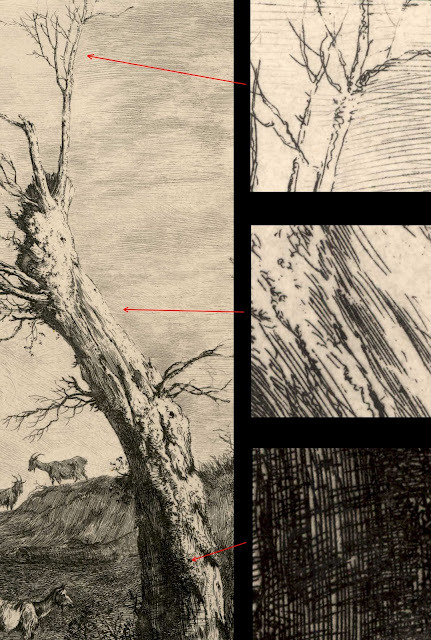 The rendering of the tree itself is where the phrasing of line may be seen. In representing the uppermost tips of the branches de Boisseau employs very lightly inscribed lines to suggest an equivalent lightness in the branches’ physical weight but as the line work rendering the silhouette edges and surface contours of the tree’s trunk progresses towards the ground the marks become increasingly darker and stronger connoting the tree’s solid mass and weight (compare the details further below). Condition: Strong impression with small margins and light pencil inscriptions of a dealer’s stock inventory details on verso otherwise pristine condition. I am selling this print for $210 AUD including postage and handling to anywhere in the world. Please contact me using the email link at the top of the page if you are interested. 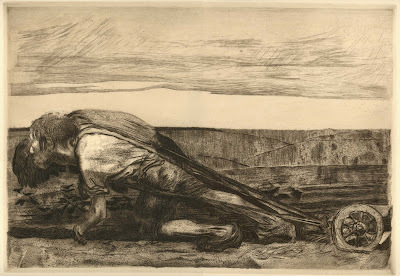 In Alphonse Legros’ (1837–1911) masterly, Viel Espagnol [Old Spaniard] (shown below), the phrasing of each line reveals the artist’s active engagement in “feeling” out the figure’s form in terms of its contours and where the form is weighted. For instance, the swelling (i.e. bulging outwards) of each line from a faint beginning and back to an equally faint ending like a lanceolate leaf shape (i.e. a shape that is pointed at each end) gives form to the Spaniard’ gown as it lightly wraps around his front arm. This swelling, however, is not a perfunctory exercise. 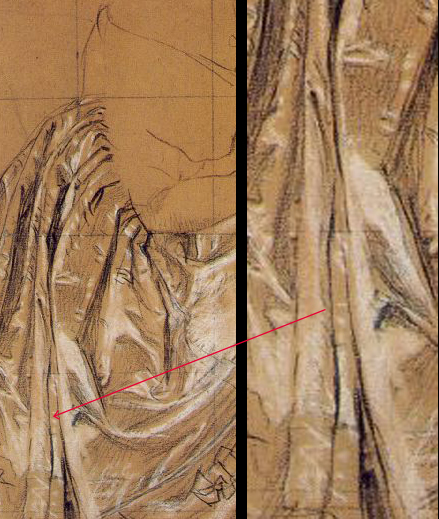 The point of maximum swelling in the lines is assigned to where the weight of the arm places tension on the fabric of the gown (see details of the lines further below). In essence, this subtle phrasing is the “secret” to using the principle of weight in a line meaningfully. Condition: Marvellous impression in superb condition with generous margins and minimal handling marks. I am selling this print for $210 AUD including postage and handling to anywhere in the world. Please contact me using the email link at the top of the page if you are interested. The third principle, projecting a line, is closely linked to the phrased swelling of line that Legros employs in Viel Espangnol. What I mean by this is that his use of the swelling creates the illusion that the centres of the lines advance towards the viewer. 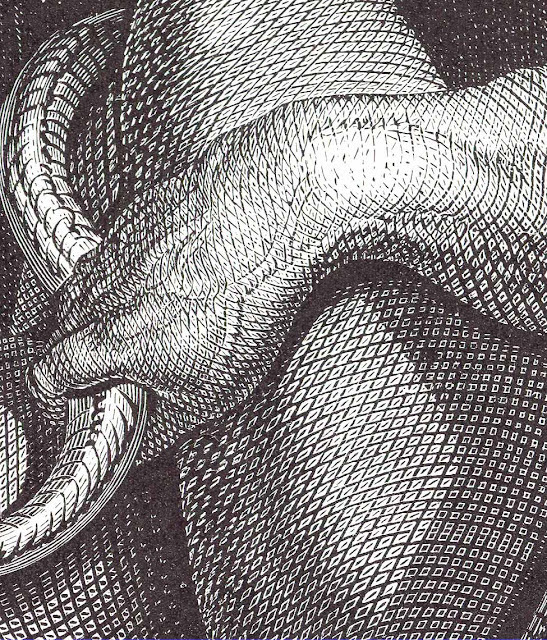 Or to explain this in a different way, the principle of projecting a line as used by Legros is as simple as applying the rules of perspective: the larger the swelling and the darker and more opaque it is, the more it advances. 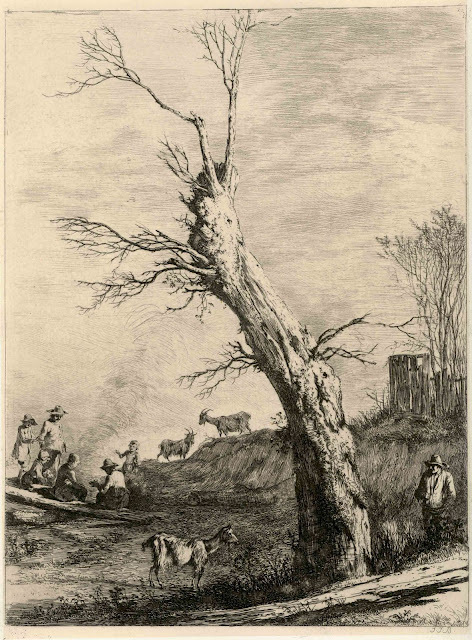 An example of this phenomenon may be seen in the companion print to de Boisseau’s L’Hiver [Winter], Le Printemps, d’apres un dessin fait a Saint-Chamond [Spring, after a drawing by Saint-Chamond]. Here, the eye is directed into the distance by limbs of a weathered tree similar, but in a mirrored position, to the one featured in L’Hiver. In terms of de Boisseau’s phrasing of his lines to express spatial projection, I wish to draw attention to the tonal transition from fine marks at the distant ends of the far right branch to the dark tones and much stronger marks where this limb connects with the trunk of the tree (see details of this change further below). 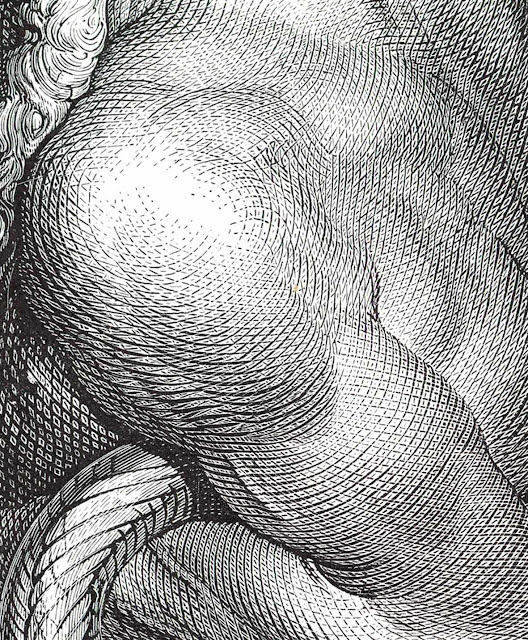 The final principle, squishing and stretching a line, has a long pedigree extending back to classical Greece with their sinuous S-shaped (contrapposto) pose for sculpture. The idea of compressing one side of the figure (usually by shifting the weight of the figure to one foot) and countering this compression further up the figure gives vitality to the figure by opposition of tensions. 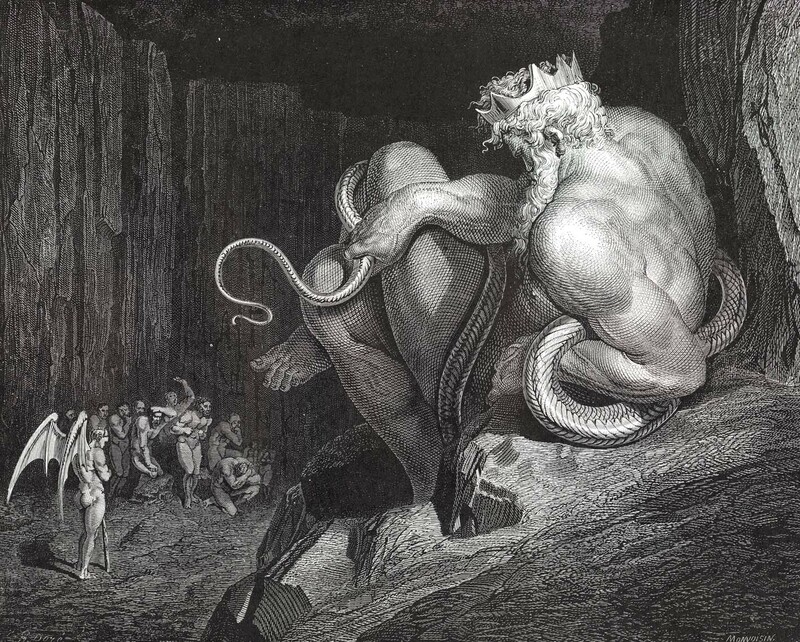 Importantly, however the spectacle of this opposition is inherent in how the artist portrays the complementary effects. In terms of phrasing a line, the physical state of compression is represented by a swelling line. Conversely, the notion of stretching is represented by a thinning line. Usually the use of these complementary effects is not a conscious decision but happens at an intuitive level. 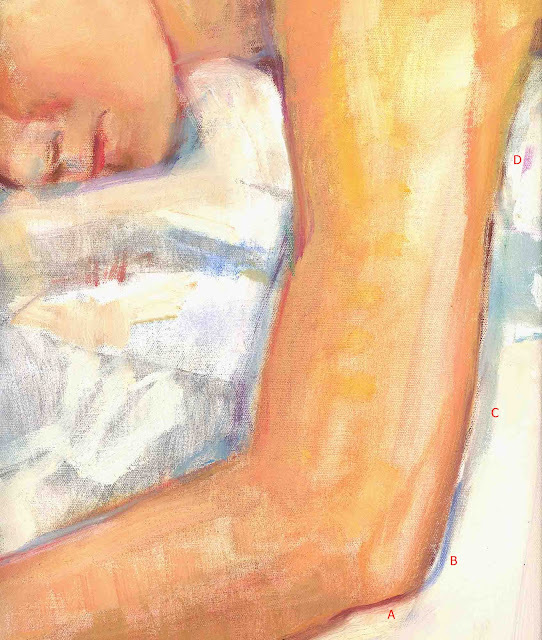 Like all good illustrators—especially cartoonists—the principle of squishing and stretching underpins their work. For example, in Paul Gustave Doré (1832–83) illustration There Minos Stands (Canto V., line 4) (shown below), note how the Mino’s biceps are drawn with a thick and very dark line whereas his triceps are drawn with a much finer line. 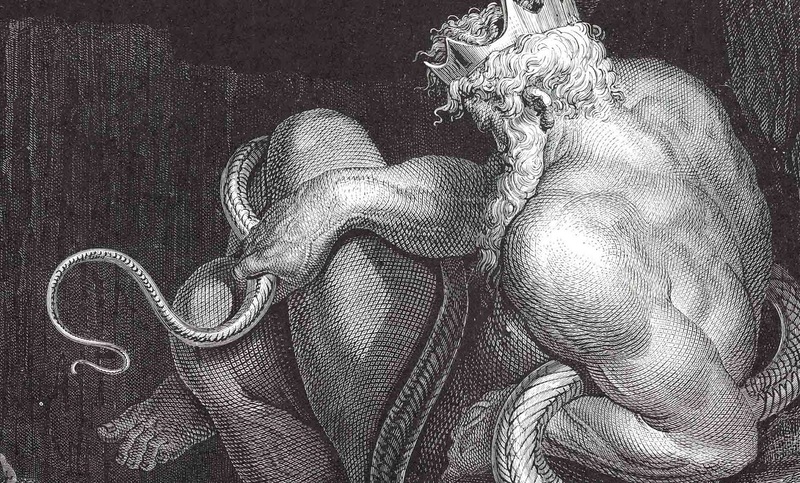 This phrasing of line may also be seen in Minos’ forearm and hand (see details further below). 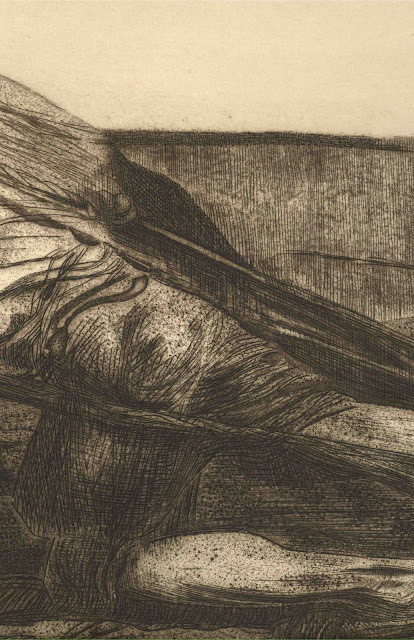 Beyond employing this principle as a “natural” practice when drawing, the principle can, of course, be exaggerated to show feelings that go beyond the everyday world. In Käthe Kollwitz’s (1867–1945) powerful and very large etching, Die Pflüger [The Ploughmen] (shown below), the phrasing of line is a fundamental visual device in expressing the extreme physical stresses involved in ploughing. Of course this image is much more than an illustration of farmer labouring. This is an image of desperation and the phrasing of line signifies the almost superhuman tensions of pulling the plough underpinning the image. Note in particular the difference in treatment between the fine and straight lines representing the strain on the harness around the closer figures’ legs and the thicker contoured lines portraying the creases in his clothes (see details further below).